My favorite women’s basketball team fell hard today in the first round of the playoffs. 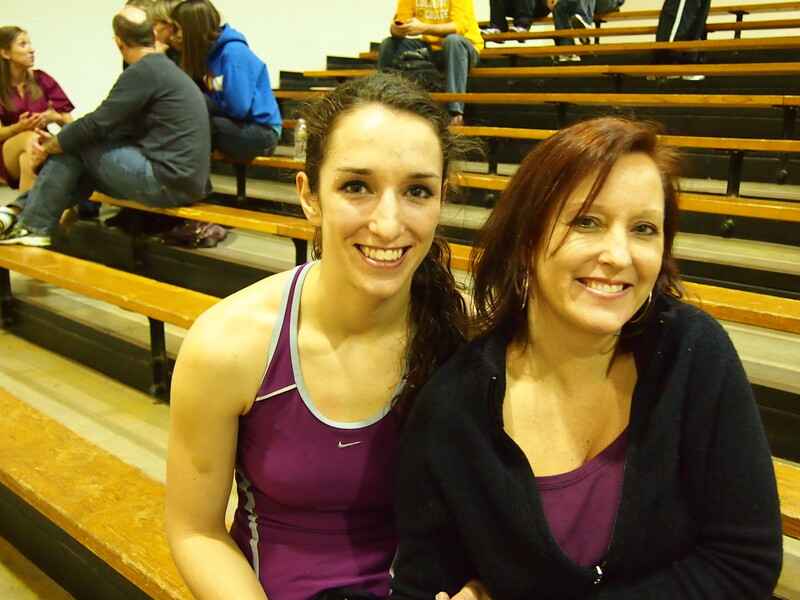 Becky, hot sweaty and no makeup after the game, with her beautiful mom. Losing the game today is part of sports and does nothing to diminish all she has accomplished. Becky is still amazing and is my hero. Her mom, our daughter was instrumental into her growing into the person she is. Her mom is amazing herself and we are so proud of her as well. Those two are very close. Becky and her younger brother spent a lot of time with us and usually got along so well, but there were times I thought they might kill maim one another. Today I have my youngest grandchildren and they are busy fighting arguing over the iPad. History repeats. Tagged children, family, Fun, multi-generational, Observations, short blog. I took a little break from illustrating and added some graphics to one of my favorite photos from last spring. 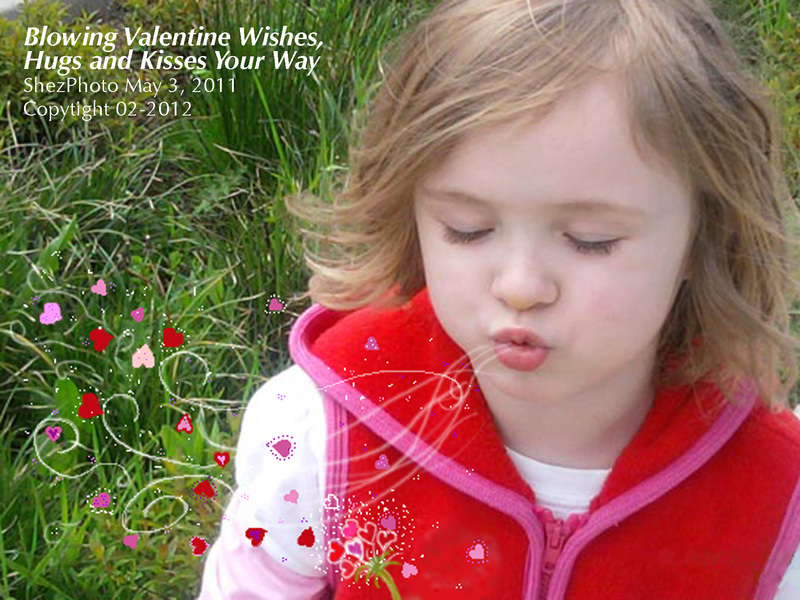 Here is my Valentine for you. Tagged beauty, children, Fun, Illustration, short blog. A bit of bright yellow sunshine to brighten your day. These are not my pretty parakeets, but I was captured by their lovely colors. This was taken on a cold winter day at the local pet store. They looked so cheerful and sunny. 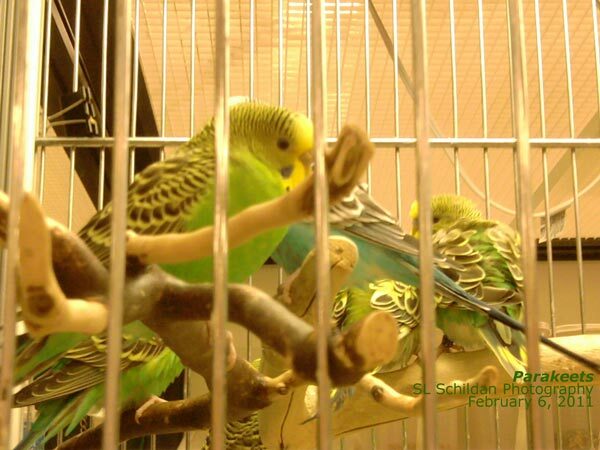 A couple of times in my life I had parakeets. I loved them, but I did not like cleaning up the feathers and seed husks that always flew out of the cage. And I did not like them living in a cage, but letting them fly free in the house was not a good option. My first parakeet was a medium-blue fellow. If memory serves me well, his name was Petey, not too original but something typical of a 10-year-old. My sister had a turquoise colored one. One day when I got home from school, something was wrong with Petey. I called mom at work. No she insisted Petey was fine. When my parents were home I showed them Petey. There was something wrong with his eyes, they didn’t look right, they were beady. Of course, they reminded me all parakeets have beady black eyes. No, I insisted this bird’s eyes were too close to the top of his head and he was afraid of me. After much badgering from me for over a week, my dad finally caved. He had found Petey dead in the cage one morning. He was distraught and in Super Dad fashion and not wanting me to feel badly, he dashed out and replaced him with an identical match. Neither he nor mom figured I’d be the wiser. I was unhappy with them for trying to trick me as if I wouldn’t know. And I was angry that they would think I wouldn’t know the difference. To some people he was just a blue parakeet. To me he was my friend. You just can’t replace a friend. I signed in to the 365 days of photos challenge, but I think the badge is on my Totally Radom Shez Blog. Random Shez gets a post on ODD days. This post arrives on EVEN days. Several days in a row of company has been amazing. There is nothing better than spending time with my favorite people. Unfortunately, it did not give me time to post. I did take some photos that I do want to share. We had invited our young grandchildren to come “party-in” the New Year. That gave their parents a guilt free New Year’s Celebration. So we had fun. 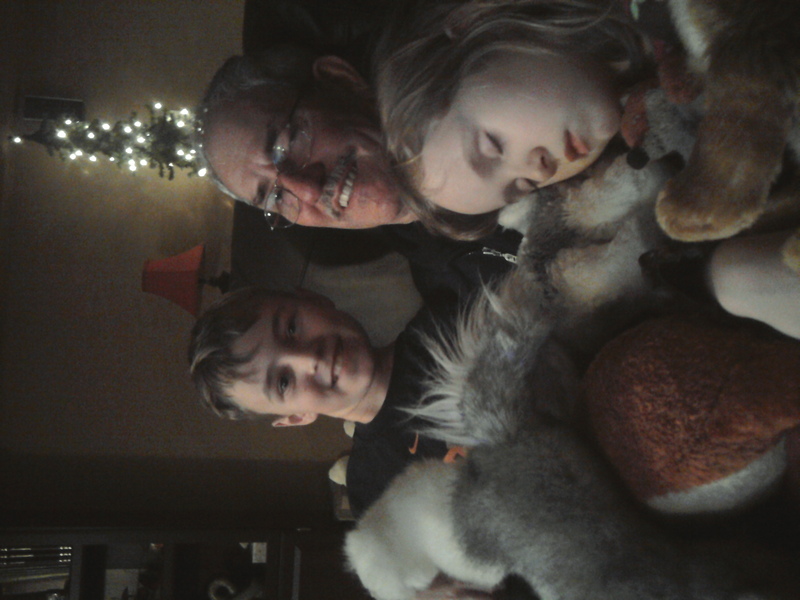 But our youngest one fell asleep snuggled with her stuffed animals and using grandpa for a pillow. Older brother has managed to stay awake for New Years for several years. He so looks forward to running out as soon as the NYC ball drops (3 hours delayed on west coast) and yelling, “Happy New Year.” Then jumping up and down waiting to hear the responses. This year any responses were drowned out by house rattling loud booms and huge overhead fireworks unfolding against the sky. It sounded more like cannon fire than fireworks, but it was fun. Hayden was laughing so hard at all the commotion he couldn’t tell if anyone responded. Our big fountain seemed small potatoes in comparison. We all had so much fun that Hubby and my Champagne is still uncorked in the refrigerator awaiting another celebration. One that probably won’t include youngsters. Cheers and wishes for a wonderful 2012 is being sent your way. Here is the link to my post at Totally Random Shez. You might enjoy catching me there where I show you the stuff from the luncheon. It was such an honor to have the Colorado College Women’s Basketball team to our house for lunch last Sunday. I think you will enjoy the pictures. Also I am excited to finally have a new company blog. Actually the company is not new, it has been around since 1997, it is the BLOG which is new. I’m thinking it might be a great way to spread the word about what we do. It is my day job. And if you travel out-of-town or work during the day, you need to check out our line of products. It may be something you’ve been looking for. Tagged All the Fun Stuff Happens at my Totally Random Shez blog, family, Food, Mailboxes, short blog. This is a copy and paste of a blog I follow by Xandre Verkes of South Africa. I had to share it as is. I the next few days I will follow the directions and surprise someone else with a much earned and/or needed pat on the back. For tonight I encourage all to check our Xandre’s fun blog. First of all – – – super many thanks to The Island Traveller & Lawnmower Vision Questfor awarding me with the Liebster Award!! I am so blessed that there are (in fact) people who read my blog & actually enjoy it (could you believe?) … It certainly makes me superly happy to know this!!! I love the posts of both these blogs & would definitely be disappointed if you do not visit their blogs… Lets honour this award for what it is & what the purpose of it is!!! Please click on the links to their blogs (opens in new window)!!! A Liebster Blog Award is given to talented bloggers who have less than 200 followers. “Liebster” is a German word that means “Dearest” or “Beloved”. It also means ”Favourite”. So, in a way the award not only recognizes these bloggers as amazingly gifted in their own right but also as your very own personal favourites. 1) Thank the fellow blogger who awarded it to you. 2) Link back to the said blogger who shared the award. 4) Pick 5 other blogs you want to recognise. 5) Visit the 5 bloggers and let them know that they receive the award. 1. 2 Rivers Photos – Posting regular (stunning) photographs!!! 2. Paris at my Doorstep – Becca (or Rebecca) takes me on a journey as she Journals about her expat adventures!!! 3. Shez Blogs – Shez is a writer, illustrator, photographer… & friend!!! She writes about her daily projects & activities, & sometimes just photo or two!!! 4. Photos from the Loonybin – Cindy is inspired photographer, very new to the blogging world, who wants to learn &broaden her skills!!! 5. Filipe Miguel Photography – Hobby photographer from Portugal, almost always first to leave me a kind comment on my posts!! My blog would be lonely without him!!! 6. John Stirling Photography – Landscape/Travel photographer with great photographs & always a kind word to spare!!! These are all great blogs & I have found a friend in all of them!!! Take the time to go and discover these amazing blogs… I guarantee that you will like them a lot!!! Tagged All the Fun Stuff Happens at my Totally Random Shez blog, Observations, short blog.